Source: Federal Reserve Bank of St Louis and Reuters Datastream. Wall Street achieved record highs last week for the benchmark S&P 500 Index (black line). This extraordinary rally has seen the US share market more than quadruple in price since the lows of March 2009. A pantheon of positives are cited as supporting US shares – the strong US economy, moderate wages and inflation pressures, gradual interest rate rises and the corporate tax cuts. Given these favourable tailwinds, corporate profits have surged by a remarkable 25% over the past year to June 2018 (according to Factset). However there are warning signs that US shares are becoming all too exuberant. Investor surveys and market positioning measures show that the optimism on US shares is very high. This sentiment gauge* (red line) is also notably above the share market peaks of 2000 and 2007. Wall Street may seem a safe haven given the current turbulence in emerging markets such as China, Argentina and Turkey. However the high US sentiment gauge result suggests that investors appear overly confident of Wall Street’s prospects. 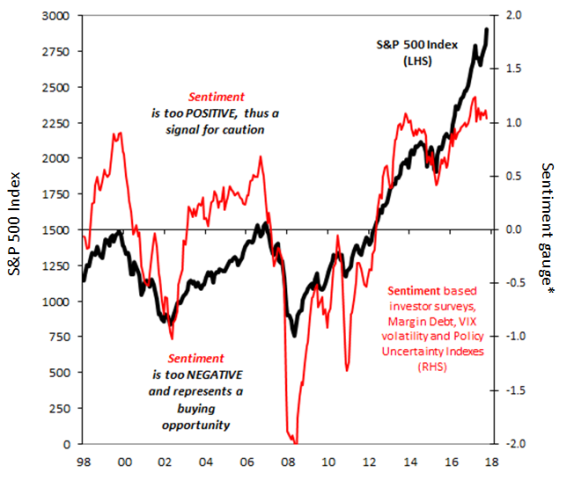 *Sentiment gauge based on VIX volatility, household share holdings, Sentix investor survey, Margin Debt and Policy Uncertainty Index.